Boto is a Portuguese name given to several types of dolphins and river dolphins native to the Amazon and the Orinoco River tributaries. A few botos exist exclusively in fresh water, and these are often considered primitive dolphins. The botos are a paraphyletic group, defined largely by their evolutionary convergences. The genus Sotalia is divided into two species. The costero (S. guianensis) is distributed in the Atlantic, from Florianópolis in Santa Catarina, Brazil, and northwards. The tucuxi (S. fluviatilis) lives in the rivers of the Amazon. Burmeister's porpoise is marine and lives from Santa Catarina to the south. The Amazon river dolphin (Inia geoffrensis) thrives in fresh water, is endemic to the Amazon basin, and is placed in the Data Deficient category of the IUCN. The Araguaian river dolphin (I. araguaiaensis) is a newly identified species native to the Araguaia-Tocantins basin of Brazil. 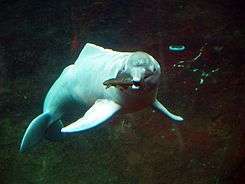 The La Plata dolphin (Pontoporia blainvillei), another vulnerable Brazilian denizen, is a marine river dolphin that ranges from Espírito Santo, Brazil, to the south. ↑ Reeves, R.R. ; Jefferson, T.A. ; Karczmarski, L.; Laidre, K.; O’Corry-Crowe, G.; Rojas-Bracho, L.; Secchi, E.R. ; Slooten, E.; Smith, B.D. ; Wang, J.Y. ; et al. (2011). "Inia geoffrensis". IUCN Red List of Threatened Species. Version 2012.2. International Union for Conservation of Nature. Retrieved 18 January 2013. Database entry includes a lengthy justification of why this species is data-deficient. ↑ Hrbek, Tomas; Da Silva, Vera Maria Ferreira; Dutra, Nicole; Gravena, Waleska; Martin, Anthony R.; Farias, Izeni Pires (2014-01-22). Turvey, Samuel T., ed. "A New Species of River Dolphin from Brazil or: How Little Do We Know Our Biodiversity". PLOS ONE. 9: e83623. doi:10.1371/journal.pone.0083623. PMC 3898917 . PMID 24465386. ↑ Reeves, R.; Dalebout, M.; Jefferson, T.A. ; Karkzmarski, L.; Laidre, K.; O’Corry-Crowe, G.; Rojas-Bracho, L.; Secchi, E.; Slooten, E.; Smith, B.D. ; et al. (2012). "Pontoporia blainvillei". IUCN Red List of Threatened Species. Version 2012.2. International Union for Conservation of Nature. Retrieved 18 January 2013. Database entry includes a brief justification of why this species is of vulnerable.